Print driver host for 32bit applications has stopped working. 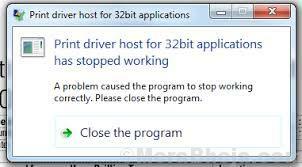 The interesting part is that 64-bit drivers work for both 32-bit and 64-bit systems. We could use this fact to resolve the issue. 2] Go to Devices and Printers. 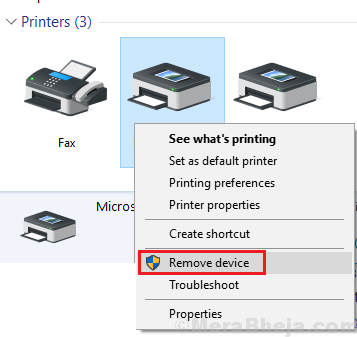 3] Right-click on your printer and select Remove device. 5] Go to Devices and Printers as explained above. 6] Click on Add Printer and add the printer. Since the issue is with the drivers, we could update the drivers. However, this step is to be performed strictly after reinstalling the printer since the computer needs to know that a change with the printer device happened. Else it might push the outdated drivers again. Here’s the procedure to update drivers. Microsoft is aware of the fact that manufacturer’s are not quite interested in supporting 32-bit drivers, thus they are pushing fixes, usually allowing Printers to use 64-bit drivers in form of Windows updates, thus we should keep updating Windows from time to time. Here is the procedure to update Windows.